This photo was taken on November 11, 2016 at 3:05PM. The location was at a busy intersection in Kensington, Maryland. The "Take It!" came after a few moments of contemplating this at a very long traffic light signal. The fascination and appreciation was slow to arrive in this, what is usually a quick grab and go requirement for many of my photographs. That the sky was so blue and cloud filled with some tree images showed up in only one of the two windows on the back of this truck was almost transfixing. The fact that there were ladders all over the place on the truck was not completely uncommon but some little things made it different. The ladder that was vertical was permanent, while the others were there for the ride and the eventual designated job. 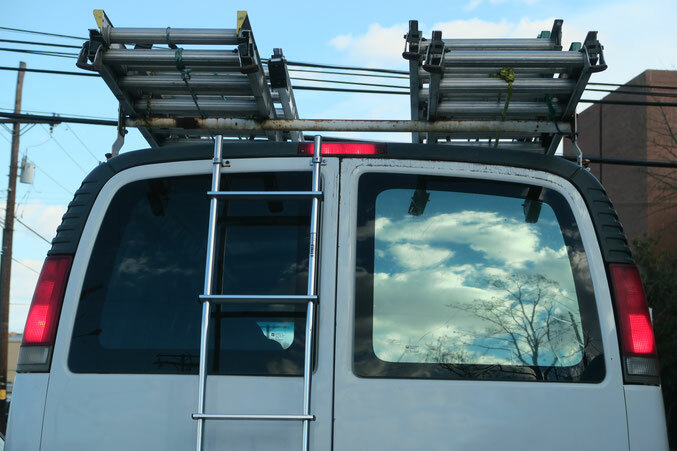 The reflection/shadow of the feet that stabilize the ladder when it is standing, was interesting to see in the top of the sky picture reflection in the rear window. This is a view of these feet that are above the sky rather than at the very bottom of a view composite in real life, was fascinating to me. When looking at the window on the left, one can see all the way through the truck to the shoulder of the driver and a little part of the windshield in front of him. This is but one part of the torso that has a foot dedicated to stepping on the brake to light up the brake lights in the rear of the truck which is a part of the reason for our being able to contemplate this whole thing. The After Take: The light finally changed in our favor and we all moved onto our way. I did not think to look for signage on the side of this van as we made the turn, only to turn my attention to safely navigating my way in what was the beginning of the onslaught to either finish jobs of the day, or make ones way home. Either way, it was once again earning its title of the "Rush Hour" but with just a small window of beautiful cloud filled sky presented as a calming moment in the midst of near mayhem. Ladders turned out to be a welcome accessory. Thanks for joining me, as yet another ladder brings attention to the real view. The reflection on the right window looks like one of them pull down shades some cars have. That guy has got to be a roofer...or he has a thing for ladders lol. Wow the window is a crystal clear image. Its perfect! The van is probably a cable and or phone company van. My first job was for AT&T, their vans looked almost exxactly like this one from behind.